If you are looking for a pet rabbit please send me an email to let me know what you are looking for and I will let you know if I have any animals that might work for your family. I am looking to downsize - if you are interested in providing a good home to any of my adult rabbits please let me know. Thank you! I have a few nice breeding bucks available (Hollands). I do not have any adoptable bunnies available right now. I do have room for fosters/surrenders. 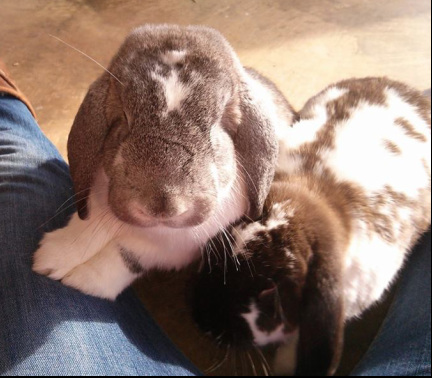 Bonded pair of Mini Lop bunnies - have been adopted! Please read the Sales Policy at the bottom of this page before contacting. We will NOT hold rabbits without a deposit paid. Please also visit the Adoption/Rescue page to see more available rabbits. Make sure you read the Sales Policy (below) if you are interested in purchasing a rabbit. Thank you! - We only accept cash as payment at pick up time. We can also accept Paypal for deposits if necessary (additional fee will be asked if Paypal is used - to cover expense of this online service). - Please bring exact change when you are planning to pick up your rabbit. - We typically do not allow people to pick up rabbits at our rabbitry because of security and to ensure the safety of our family and pets. - You must meet in Greensboro, North Carolina to pick up your rabbit. We usually meet at the Walmart shopping center off of I 85 at the South Elm Eugene Street exit - number 124, the address is 121 West Elmsley Drive, Greensboro NC 27406. If this location does not work for you we will try and work out another location. We will not "meet you halfway". We will not travel more than 20 miles from our home in South East Greensboro/Guilford County, unless we already have a trip planned. You may also pick up a rabbit from us at any show we are planning to attend (note my current work schedule does not allow me to attend many shows). - We will NOT hold a rabbit unless at least half of the price of the rabbit is given as a deposit to reserve your rabbit. Deposits are not refundable. If you pay your deposit through paypal a $5 additional fee will be added to price. - We reserve the right to deny/refuse any sale or adoption of any of our animals at any time, we will only do this if we feel that it is in the best interest of the animal. Please examine your rabbit before purchase (at time of pickup). We will not issue a refund or replacement rabbit unless written confirmation of illness or defect from a licensed veterinarian is presented within 48 hours of purchase. We will not rehome or sell an animal we feel is unhealthy. We will not be responsible, under any circumstances, for any veterinary bills incurred by rabbits that we have sold. - Multiple Animal Discounts - We will usually take $5 to $10 off the price of the second rabbit if you buy more than one rabbit at a time. - If for any reason you can no longer care for a rabbit you have bought from us, we will always be willing to take the animal back (as long as we have cage space, or if you can send a cage with the bunny), no refund will be given.